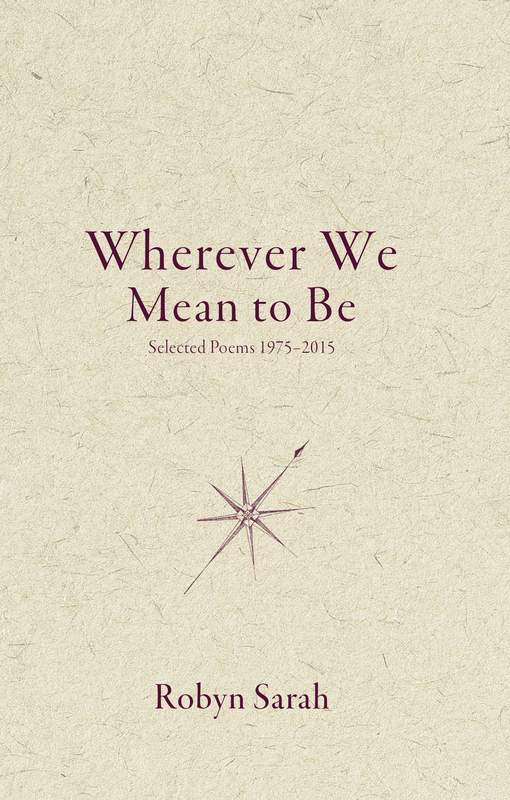 Wherever We Mean To Be / Selected Poems 1975 - 2015. Robyn Sarah. Biblioasis. Windsor, Ontario. 2017. Any poet in Canada would kill to have Robyn Sarah's list of publishers behind their names. Okay, I wouldn't kill, but I might maim. The K seal of approval will start this production. As I sometimes do, I read some poems to K last night after we'd retired to our reading stations in bed. I read K Robyn Sarah poems. The first clue was that K didn't say stop. K loves poetry, but she doesn't love it all. Robyn Sarah passed the very difficult K standard with flying colours. It shouldn't come as a surprise, Robyn Sarah has been writing about those moments that make up a life, a relationship, a childhood, with candor and a firm tenderness since she first crossed Today's book of poetry radar back in the late seventies. There are no strange animals in Sarah's poetry forest, but you'll recognize the beasts and the fauna. up to the road, and walk back home that way. I should have had no trouble finding my way. Where I came up, though—something blocked the light. It was the sameness that surprised me. a forest of it. Higher than my head. banking on where I thought the road must be. Today's book of poetry thinks that "Broom at Twilight" would safely pass as the life story of most of us. The best laid plans leading to an ominous turn of events, none the less we plunge ahead with hope. and because they are ours." Today's book of poetry is a little muddle today for a variety of reasons. Almost all of them good ones. Our hero/mentor/buddy Stuart Ross has taken up residence in the Today's book of poetry guest room. It should have his name on it. Yesterday Today's book of poetry got a package in the mail from our St. Louis correspondent David Clewell. Campbell McGrath and David Hilton arrived in such bounty that we are blushing. Today's book of poetry is also rushing a little. K and I are heading to Peterborough in a few minutes to see some family and look after some business, maybe have a northern route road trip on the way back tomorrow. It is always good to see family and we will both see our sisters and that's just about the best trip you can take. Looking forward to seeing family and thinking about my friendships with Stuart Ross and David Clewell make me all poetry sentimental and now I want to throwout my Robyn Sarah notes and tell you that Today's book of poetry was compelled to write about Wherever We Mean To Be. A few days have passed. We looked after our Peterborough business and made it back to Ottawa. Stuart Ross has left but we are expecting a visit from Larry Cowan today. Today's book of poetry and Mr. Cowan have never met in person so we are excited about that. Mr. Cowan's Monk Press is going to do a chapbook for us in the not too distant future. Sarah's poems have been swirling around in my head for the last week. Usually Today's book of poetry is on to the next thing, the next poet, the next blog. Robyn Sarah has lingered like a much welcomed house guest. heard long enough, becomes silence. Our morning read was orchestrated by our new intern, Maggie, and she did a splendid job. Maggie could have been a conductor for music or for a train, she's a talented young woman. Maggie assigned each of us particular poems, using Maggie logic, and it seemed to work out just fine. Robyn Sarah had a great deal to do with that. Sarah, much to my great delight, doesn't build any walls around her poems, they are all the same, they all pull you into her narrative as though you'd been there all along. Robyn Sarah writes solid poems that you can depend on. "You're rich, and you want to be loved like a poor man." Today's book of poetry has been reading Dame Robyn Sarah since the late 70s and almost always with a hint of jealousy. It takes a lot of polished brass to hit the mark and keep on hitting it. Sarah has been consistent all these years. Wherever We Mean To Be is a beautiful comfort and Robyn Sarah remains a clear investment. Spending time with Robyn Sarah's Wherever We Mean To Be will be poetry time well spent. Robyn Sarah is the author of eight poetry collections, two collections of short stories, and a book of essays on poetry. Her most recent poetry collection is Pause for Breath (Biblioasis, 2009). Le tamis des jours, selected poems in French translation with parallel English text, was published in 2007, as was Little Eurekas: A Decade’s Thoughts on Poetry. Her writing has appeared widely in Canada and the United States, and her poems have been anthologized in Fifteen Canadian Poets x 2 and x 3, The Bedford Introduction to Literature, The Norton Anthology of Poetry and in Garrison Keillor’s Good Poems for Hard Times. She lives in Montréal.